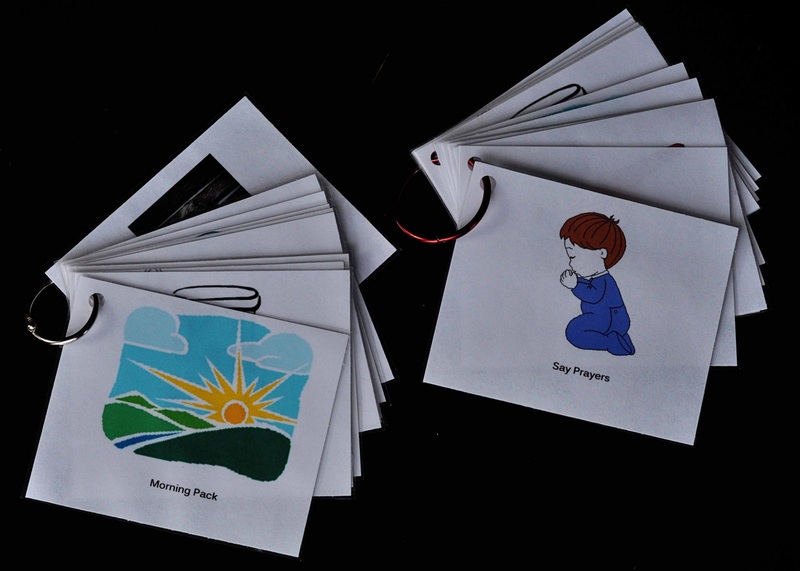 As I promised in How I Do It: Get Children Ready, here is the post on our morning chore cards. I had previously been using chore cards to help aid in getting ready in the morning (see https://www.babywisemom.com/2010/09/chore-cards.html). This was very helpful in comparison to doing nothing, but things were still not as smooth as I would like. I had to put the cards in the correct order each night or each morning, and sometimes individual cards would “wander off” and we wouldn’t know where they were. So I got thinking about how to improve this. One idea I had was a laminated list of things and then have the child check it off as he/she did each task. But that would require leaving a marker within reach of little toddler hands, and I have a policy against little toddler hands getting ahold of markers unsupervised. We could also do a sticker chart, but I knew that would end in lots of stickers being used in the course of a year. You could put up a chart that the child just looked at–that is a definite possibility. Being a list maker myself, I know great satisfaction comes from crossing things off your list, so I knew the children would enjoy having a way to “cross off” the completed task. That is how I got to the conclusion of using the chore cards we already had along with an O ring to keep them together and in order. Plus, an O-ring is easy enough to open if you later want to add an item, remove an item, or change the order of your items. I could keep this dynamic. I Googled what I was looking for. So for prayer, I Googled “boy praying clipart.” I then copied and pasted it into a Word document. I did that for each task. You could do the same, take pictures of the items in your home, or draw the pictures. I then typed the word under each picture. Next, I printed the pages. I then cut out the pictures into individual cards. I made sure each card was the same size as the others. Next, I laminated the cards. Then I cut the cards out again. The next step was to punch a hole in each card in the same spot. I then put the cards in the order I wanted, then secured the cards together with an O-ring. These are the cards we use. I chose the order based on what made the most sense to me. Some things are pretty obvious, like you go potty before you shower, and get dressed after you shower. I then had things that didn’t really matter grouped by where they would occur. So Brayden gets dressed in his room. Then he prays in his room. Then he makes his bed in his room. Then he goes back to the bathroom for brushing teeth and doing hair. Kaitlyn’s cards are a slightly different order. Her room is right by McKenna’s, so I put making bed right before eating breakfast. This way, making the bed will come later in her routine and McKenna should be awake by that point. I LOVE these cards. They make the morning routine so much smoother. I really would like night pack, also, but I worry about over-using this and losing novelty of it. It seems to be good with chores to mix things up and keep them interesting. Don’t be surprised if we have night cards soon, though. Next Post Poll Results: AT WHAT AGE DID YOU MOVE FROM THE CRIB TO BED? I think I am going to do this. This will work great for my distractable one, and I think it's a good system for any child. One thing I'm thinking of is having a before-bed ring and breaking down his clean-up-your-room task into separate cards: Put away your stuffed animals, put away your Legos, put books in bookcase, put dirty clothes in hamper, throw away trash – instead of one card saying clean up your room. I don't know if that's overkill or not, but it seems to help many children when a large task is broken down into small ones. I think that is a good idea Kristy. I know it helps me to break tasks into smaller steps–even now. I love this idea and was wondering what age did you start this with your kids? Erika, I started this exact thing only a couple of months ago. Four years old is definitely old enough. I could see McKenna doing this if I walked her through each step. As a follow-up comment, I've been doing morning cards like this for both boys for almost a year now. Our older son (now 6) never complains about morning cards like he might complain if I asked him to do a single task. Our younger (now 3) really likes having morning cards to do. It's helpful in setting up his routine in an enjoyable way. I still (so far) have to do each one with him, but I can see the day coming when he can handle this on his own. I have also decided to do this only for mornings and do some of Valerie's and other people's other ideas for chores at different times of the day. It really does help to switch things up a bit and have some variety.